The EUA market had been testing the downside over the previous three weeks, without really breaking key support levels. However, the Dec-18 contract smashed through the 17.8 €/t support level on Monday and kept falling though the first four days of last week. After hitting a within-day low of 15.1 €/t on Thursday, the market bounced to close Friday at 17.1 €/t, still a w/w fall of 6.6% in a week of high price volatility. The volatility looks largely technically driven. 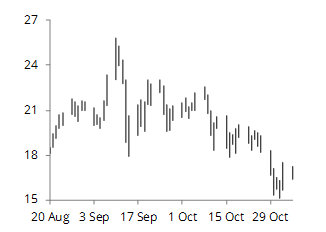 For the next couple of weeks, EUA price direction will be driven by a mix of technical indicators, some bullish pressure from the suspension of the German auctions from 11 November, and bearish concern over the high levels of open interest (OI) on Dec-18 options and futures expiries, which are now only slightly more than a month away. We expect this current week to start with more upside than downside bias, but we do think it will be hard for the market to go above 20 €/t with so many call options tipping into the money at that strike price. On the downside, the market bounced off 15.1 €/t on 1 November and that does now look like a key point of technical support. 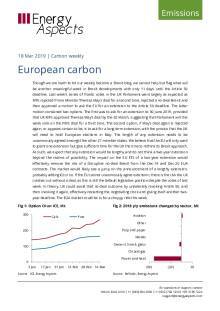 The UK government’s autumn budget last week provided some more clarity on the country’s carbon pricing in the event of a no-deal Brexit. 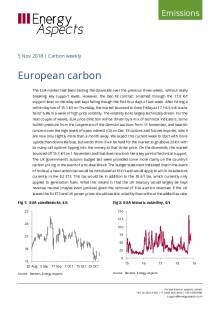 The budget statement indicated that in the event of no deal, a new carbon tax would be introduced at 16 £/t and would apply to all UK installations currently in the EU ETS. This tax would be in addition to the 18 £/t tax, which currently only applies to generation fuels. What this means is that the UK treasury would largely be kept revenue neutral (maybe even positive) given the removal of EUA auction revenues if the UK leaves the EU ETS and UK power prices should see less volatility than without the added tax rate. Our discussion above suggests that the Dec-18 EUA contract could spend the coming six weeks pricing in a 15.1-20.0 €/t range, which is wide but does reflect the current hyper level of volatility in the EUA market. The fall in EUA prices over last week was accompanied by the OI in the Dec-18 futures contract falling by 5.2 Mt, while OI in Dec-20 grew by 6.1 Mt. As such, it does seem that some of the ‘buy and holds’ could well be rolling positions forward and some of the price weakness that we expected at the Dec-18 expiry is being felt now. Despite the prompt selling off in favour of buying and holding further-dated contracts, the contango across the curve has continued to narrow. The implied annualised cost of carry between the Dec-18-Dec-20 contracts has fallen from near 5.0% per annum in the second week of October to just 2.6% at the start of November. With the market pricing out the super contango, it does look like there has been enough capital entering the market to do the repo trade (buy prompt, sell forward), which suggests that high contango rates might not be seen again. While some of the Dec-18 expiry risk is being played out in the market now, taking profit early is harder to do in the options market as these are all European options, which can only be exercised at expiry. 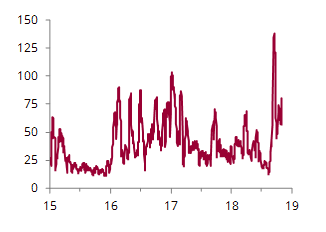 At a 17 €/t strike, the OI in calls on ICE are now 121 Mt, while the OI of puts in the money are at 36 Mt, still suggesting that still a good proportion of the net volume of 85 Mt could be sold back into the market just three days before expiry of the Dec-18 futures. There are still lots of moving pieces in the EUA market, but getting back above 20 €/t before option expiry now looks very unlikely. 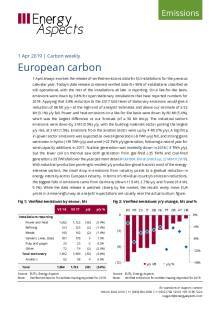 Next week's edition of Carbon weekly will be published on Tuesday 23 April, owing to the UK bank..
EUA prices gapped up in the second half of last week despite 2018 verified emissions coming in at..
1 April always involves the release of verified emissions data for EU installations for the previ.. It was another eventful week in the UK’s Brexit saga, which helped further soften EUA prices to 2.. Though we are loath to let our weekly become a Brexit blog, we cannot help but flag what will be..